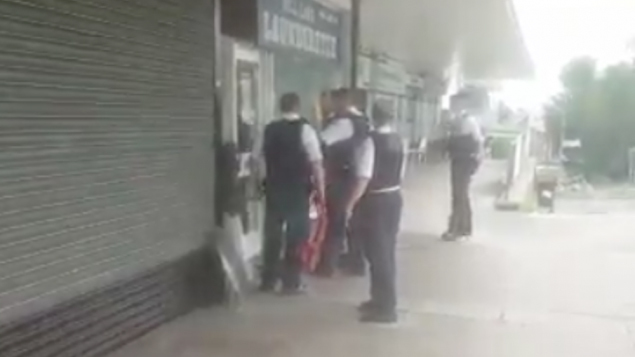 A man was detained under the Mental Health Act after having been apprehended with two knives in Hendon, NW London, on Shabbos morning. He was seen running down the main road towards Toras Chaim shul, but did not try to enter it. The man, who was barefoot and wearing only a pair of shorts, was carrying one large and one small kitchen knife, when he was stopped outside the shul by its CST (Community Security Trust) volunteer. The volunteer and the shul’s professional security guard spoke to the man for a few moments before he ran off again. The CST always has volunteers on foot patrol in Jewish areas over Shabbos and these were alerted to the incident. Four volunteers chased after the man, who ran into a launderette on a nearby parade of shops. The volunteers saw that the shop was otherwise empty and held the door shut until the Police arrived. Other CST volunteers and local security guards were also present on the scene. There appears to have been no issue of anti-Semitism or terrorism, and it is not clear whether the man was aware of the presence of the shul. However, irrespective of his motive, the incident was potentially very dangerous and the CST and security guards are to be commended for their bravery and presence of mind in tackling and containing the man until the arrival of the Police.